Things are starting to trickle out of Norman about the state of the program and issues that were dormant to the public while the team kept winning are now awake. This sort of thing tends to be true of every team, I’m sure Alabama has issues right now that no one would ever guess at that could seem crippling if they were exposed after a loss. Some of the issues include a report that it was OU’s new CEO-style president that dictated the change. Lincoln Riley strongly denied that report in his press conference, nothing that the great programs don’t do things that way, yet there’s an awful lot of smoke around the idea that Jim Gallogly pushed this on Riley. This report also included the tidbit that Ruffin McNeil wanted nothing to do with the DC title at Oklahoma. Then Riley made McNeil the man, which I honestly expected to occur during 2017, but bumped Bob Diaco from consultant/analyst to OLB coach and booth man. Some reports seemed to suggest that McNeil will be DC but Diaco will call plays, I don’t know if that’s right. The two of them have a lot to work on over the course of the season. The problem is that you can’t fix a defense in a few weeks if the bones are bad. Sometimes teams get off to a bad start and they need a little tweak, a position change, or a fire lit under them to help them order themselves. But units that don’t know how to play at a high level don’t learn it quickly, if the right habits and skills aren’t there somewhere in the muscle memory then they have to be built and that takes real time. If you watch any of the 2017 Nebraska defense that Bob Diaco was brought in to salvage on behalf of Mike Riley, it’s actually even worse than this Oklahoma defense. The Cornhuskers lacked speed everywhere and regularly didn’t play with the right leverage up front. Today’s Sooners often blow their run fits but they have speed at every level, their physical issues relate more to size, strength, and toughness. This is Texas’ tight zone play, which they ran in this game 10x for 87 yards. It’s not a zone-read play, the DE Kenneth Mann is schemed up to be handled by a RT and TE combo that climbs up to the LB (Caleb Kelly here). Ehlinger keeps the ball because the overhang (Boo Radley) flies into the backfield when he needs to be the contain player. The Sooners have so many weak spots at the point of attack here that it’s hard to count them all. Kenneth Mann, whom OU conspicuously tried to recruit over in the offseason with Notre Dame DE transfer Jay Hayes before he opted for Georgia instead, gets absolutely run over here by Texas RT Sam Cosmi. It looks like he’s trying to pinch down into the B-gap but he meets a wall and gets taken for a ride. Caleb Kelly is hesitant and unsure of his gap fits when he’s playing ILB, as was predictable after he spent the last two years trying to play as a LB/DB hybrid on the edge. The TE comes off Mann pretty quickly and hits Kelly lightly five yards down field before Kelly spins off that in order to miss Ehlinger in the open field. The deep DBs (Kahlil Haughton really) clean up after a sizable gain. This is the QB stretch play that inflicted three TDs, a short-yardage pick-up, a five yard gain on first and goal from the seven, and two lost timeouts on the Sooners in this game. Texas is in an unbalanced set and the Sooners aren’t at all in good order to defend it. One problem is that they have a CB as an overhang and there isn’t a single CB on this roster that you want in that role, none of them are physical or can tackle well. Oklahoma is loaded up with Zach Sanchez’s that don’t know how to play the ball like Sanchez did. They also have Mark Jackson as a 7-technique here responsible for withstanding the RT/TE combo that is aiming to secure the edge. Jackson is 6-1, 240 and probably would have been buried by Cosmi alone here without the TE coming on his outside shoulder and driving him into the end zone. Tre Brown is predictably knocked out of the way by the RB lead block, Caleb Kelly tries to run under the blocks after Jackson is driven back and just hits the wall, Kenneth Murray can’t get there in time and even if he did would have then had to tackle Ehlinger running downhill into the end zone. Kahlil Haughton is racing to the trips side because the Sooners only had two defenders over there which would have made the bubble screen a guaranteed score if Texas had taken it. Justin Broiles would have been useful there but instead he’s an overhang to the backside that becomes useless. Oklahoma is dangerously soft on the edges this season. While I’ve argued for years that they need to be a nickel team, the field-side combination of Justin Broiles (5-10, 181 pound RFR) and Boo Radley (5-9, 186 pound FR) is simply not intimidating and is a big reason why Texas found so many easy yards and push behind the tight zone play. Between that and the lack of strength in the play of strong side DE Kenneth Mann you have a recipe for trouble trying to defend the perimeter. Texas lives in boundary twin sets this season which put the 6-4, 225 pound Lil’Jordan Humphrey in the slot with 6-6, 210 pound Collin Johnson outside of him. 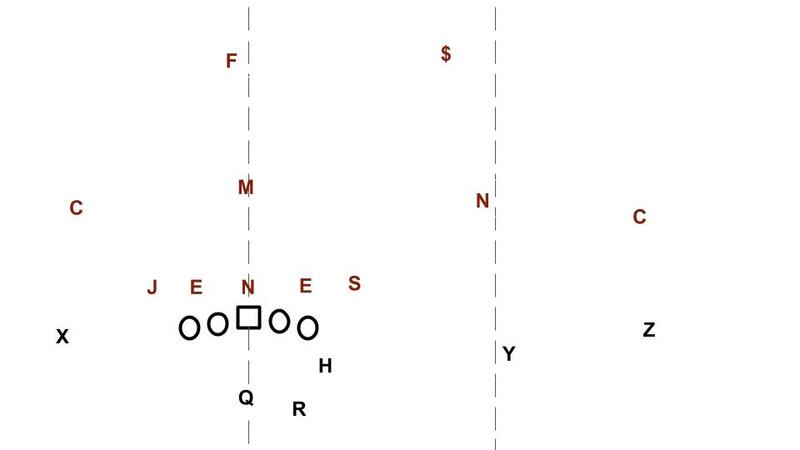 It creates all kinds of two-man route combos that are within easy range for Ehlinger and force defenses to either try to defend them with their weak side LB and free safety (normally players chosen for their run defense) or else shift their entire defensive structure. On this play everyone in the stadium knew what was coming, including the announcers who circled Collin Johnson just before the snap as you can see. This was by far the most credible defense that Oklahoma made on the double slants play for the entire game and they still got beat. It probably would have made sense to try and shift over more help to take away the inside angle for both wideouts but the Sooners tend to live or die in these man2man matchups outside and all of their corners are small and lack high level skill or physicality. This team is designed to match up with opponents in man on the outside and then to force the ball in on the edges and they just don’t have the personnel anywhere to do it right. Even when the force the ball inside effectively, their LBs are still prone to losing their gaps and the DL mix disruptive plays with other occasions where they get taken for a ride. One hilarious change that Diaco and McNeil could try would be to field a sam linebacker against all but 10 personnel sets in order to force the ball inside to Kenneth Murray and Neville Gallimore more consistently. To play base 3-4 defense. Issues with that approach are pretty extensive. One is that it would make OU pretty predictable in coverage (like last year) and invite precise targeting of a group of DBs that are clearly vulnerable and fairly easy to target. It would also make it harder to execute some of the exotic blitzes that the Sooners have leaned on this season to generate pressure since they’ve lacked a dominant edge-rusher like Okoronkwo or Striker. The Sooners are probably at their best when they play nickel but allow the LBs to flow to the ball and fill in behind them with Kahlil Haughton. That leverages the strength of Kenneth Murray’s play better but, again it makes them fairly predictable and can leave the boundary corner on an island if Haughton is regularly dropping down to support the run. Lincoln Riley has apparently pushed for a defensive approach that is aggressive and oriented around generating quick punts or turnovers rather than a bend don’t break unit that slowly (or maybe not so slowly) yields gains down the field. When Ruffin McNeil brought some good fixes to Mike Leach’s defense back in 2007 it wasn’t from that at all, but from teaching the players to execute a quarters defense and forcing opponents to beat them the length of the field. Here’s the nasty wake up call though, I don’t remember the 2007 Tech D but the 2008 Texas Tech defense was more talented than this Oklahoma group. They had some really good DEs that were athletic and disruptive, nose tackle Colby Whitlock was an anchor in the middle, the LBs and safeties would beat blocks and tackle people, and they had a plan that they could execute together. Namely, to play base defense on early downs and make everything hard, then to bring pressure on third down. This Oklahoma defense has some guys that are athletic but only a small number of legitimately good football players. Kenneth Murray is one, everyone else ranges from “promising but inconsistent” to “limited.” It’s hard to build a defense to withstand Big 12 spread attacks in which nearly everyone on the field has to be supported or protected by their teammates and can’t hold up in isolation. It’s a tite front with double 4i-technique DEs, which is normal for Oklahoma. But instead of playing with a will and a mike LB, they drop a guy down over the TE or field side and play with just one ILB (Murray, most of the time at least). The goal is to cover up the gaps and blockers up front and free up Murray to run around and make a gazillion tackles. They could play things on the back end in a variety of ways, mixing single-high looks with two-high coverages that get help over the top but the main goal would be to keep the ball channeled inside so that opponents would have to consistently get movement against Amani Bledsoe and Nevill Gallimore while avoiding Murray. They could let the safeties bracket receivers from inside out and be late arrivers to the box in the event that things leak. This would still be vulnerable to getting beat up outside by big receivers and vertical routes but there aren’t really any solutions for that problem that the Sooners are going to be able to get going this season. Players need to improve, the goal has to be to give them a simple system that helps them improve and develop skills that play to their strengths and give them a chance in the coming weeks. First the Sooners get this upcoming bye, which is crucial and will need to be occupied with solutions for the gauntlet of spread offenses remaining on the schedule. Then they head to Ft. Worth to play TCU in a game that I think many on the Norman side are overlooking. Last year was the first time since realignment that Oklahoma has beaten the Frogs by more than a TD and the main factors in those victories were Baker Mayfield and Rodney Anderson. Additionally, this TCU offense is very similar to Oklahoma’s in that it can score points in bunches if you aren’t sound or don’t tackle well. The other side of that matchup is tough as well, TCU will be the best equipped team in the league to try and contain Kyler Murray in the pocket with a disciplined four-man rush and Gary Patterson has been waiting for this rematch all year. Next up is K-State, which should be easier if only because the odds that the Wildcats will withstand OU’s offense are so low. Then comes a parade of shootouts. Texas Tech in Lubbock, Oklahoma State at home, Kansas at home, and finally a road trip to Morgantown and potential Heisman showdown between Will Grier and Kyler Murray (although that thing is probably going go Tua Tagovailoa). The Red Raiders, Cowboys, and Mountaineers all have the firepower to light up OU’s defense and it’s worth noting that the Sooners survived more than their share of these types of games over the last three years because of flawless second half performances by Baker Mayfield. The Kyler Murray Oklahoma offense isn’t flawless, as we saw in the Red River Shootout. They burn you with their speed, which can result in an even more explosive unit than they ever had with Mayfield but one that is less likely to execute a crucial drive because they aren’t as precise. My guess is that the Sooners drop another game this season with the Frogs as perhaps the most likely to inflict the L. They remind me of the 2016 Texas Longhorns, who were really good at running the ball with D’Onta Foreman but not terribly good at anything else. The 2018 Oklahoma Sooners are overwhelmingly good at hitting big plays on scrambles, screens, and play-action shots and not terribly good at anything else. That’s a dimension more conducive to winning games than what Texas had that year but it’s not enough to consistently beat more well rounded teams in competitive games. All that might be a good thing for Oklahoma, if my guesses about the S&C and overall culture of the program are right than a patchwork defense that allows them to skate by the rest of the league won’t command the kinds of changes this team needs to make next offseason. The 2019 Sooners won’t have Marquise Brown or Kyler Murray to bail them out, they’ll need a defense that is currently poised to return 10 starters to make the leap that some expected and thought had occurred this season. None of that will occur without a dramatic reshuffling of the defensive staff and strategy followed by a highly effective offseason with real buy-in, strength gains in S&C, and a more physical tone. Let me start by saying, as an Oklahoma fan, you’ve been dead on about this team all year. So, kudos to you. It only took me watching a couple of quarters of Texas football to understand that the cotton bowl would be an unfavorable match up for the Sooners. ANYWAY, obviously defensive staff changes will be made, but do you really think it’s realistic that Riley would get rid of Wylie after 1 season? Not sure that he would be ready to admit a mistake that quickly. Excellent article, Ian. Regarding S&C, how is it possible to not improve? Did they focus more on speed and actually loose strength? I would think if I was the strength coach, knowing literally nothing about weight training myself, I feel like I could make the team stronger. But, obviously that’s more of a science than I even understand. What, in your opinion, is BW‘s downfall in this area? Because, In the eye test, Caleb Kelly and Kenneth Murray looked like they became machines in the off season. I’m not going to pretend to be an expert on S&C by any stretch but I heard and related that Benny Wylie is prone to overlooking heavy lifting and the kinds of stuff that make for powerful players in exchange for trying to build endurance and whatever else. Also, that Wylie is prone to being everyone’s pal rather than being the program enforcer. Those were concerning to hear considering that “raid bro” coaches in Riley’s sphere are often prone to building units that avoid the more martial traits of other football programs and consequently aren’t always the toughest. Caleb Kelly was done a disservice when he spent the first two years learning a Sam LB position that shouldn’t exist in the Big 12, that’s time he needed to try and learn ILB which is a tough position to learn and a different animal than that OLB overhang spot. Kenneth Murray actually looks pretty good to me, of course the story on him is that he went into the offseason on a personal mission so he probably deserves most of the credit for his own development. I don’t know. I’m more concerned with the culture than Riley leaving for the nfl after 2 seasons. I don’t know that I completely buy into the S & C “program enforcer” argument, but it’s tough to dismiss it when I saw such a soft team last Saturday. I would agree with your theory about Riley not really knowing how to run a program bc he’s never been part of one at a high level. Ian’s right about Wiley being a concerning hire but wrong about why. Wiley’s strengths: Riley knows that he can build relationships with coaching staff and players. Wiley’s weakness: outdated training approaches. Being an enforcer is no way to motivate people. Please give it a rest. It’s been discredited in every sector of society (even the military). Would you expose yourself to such training? How would it make you feel? OU had an enforcer (Jerry Schmidt) who was an embarrassment and is finally gone. The fact that OU’s players spend so much time lifting to look like superheroes IS A LIABILITY. Regardless of how muscle bound they are, Murray and Bookie got juked by Ehlinger because they aren’t agile enough in change of direction. The OU defenders don’t make aggressive tackles because they lack power. Bench press and max squats work doesn’t develop the muscles needed for these skills. OU’s defense is plenty strong. Wiley isn’t failing there. However, they aren’t quick enough and can’t quickly generate power. The training program is at least partially to blame for this. Sounds good, really when I say strength I mean the ability to clash with an advancing OL on tight zone. I guess that’s really more “power,” everything in football is generally more about power. The “program enforcer” thing may not need to look like it did with Schmidt but it’s definitely a thing. How do you think practices at TCU look under Gary Patterson? Or at Alabama under Nick Saban? You don’t need to abuse kids but if you’re not forcefully challenging young men you’re not going to get their best. Because there’s going to be some degree of administering punishment and carrot/stick, probably some yelling, and an overall enforcement of a certain standard of doing things. Yeah, as you mention, Tech had the benefit of some good players. Two NFL-bound defensive backs in Darcel McBath (2nd round draft pick) and Jamar Wall (6th round), and some good pass rushers, including Brandon Williams (4th round). It was also a very young group, particularly the linebackers, so they especially benefited from a more simplified approach. I do wonder, and I’ll leave it to more advanced football minds than me to answer the question, if going extremely simple works in today’s big 12. It aseems like the offenses Oklahoma will be facing are capable of asking questions of a defense that require more complicated answers than the 2008 big 12 offenses, with the possible exception of Bradford’s OU. And of course, they torched the Tech defense. But I guess simple, sound, in the right place, but getting out-schemed would be step up from complex, unsound, in the wrong place, and still getting out-schemed, which is what they seemed to have with Stoops. OU’s pretty good at big play prevention this year, but they need better efficiency. There are some simple things they can do. OU’s defense played 190 snaps in the two games leading to the Texas game. A significant subset of the starters play most of those snaps. It’s amazing there weren’t more injuries. OU’s got talented young defenders who need to see the field for the youngsters development and for the health of the starters. Scouting and responding to offensive weakness has been unbelievably lacking. In the Venables era, OU’s defenses relied on knowing opposition tendencies and playing to eliminate them (possibly to a fault as the Sooners fell prey to ruses at times). In the last few years, Stoops has seemed to be oblivious to team-specific strategies at times to the point that OU’s lost games before kickoff (e.g., Ohio St, Baylor). Accepting basic tenants of team preparation and plan adjustment would be a great start. 1. Preparation –> OU should be better aware of team’s tendencies. Prepare more players to play. Keeping people fresher improves focus and morale. 2. Alignment –> simplification of alignment at this stage is key for #3. 3. Confidence in themselves and their scheme — confidence can be improved simply by having a calmer leader who displays more equipoise. The schemes themselves don’t need to be complicated for the defense to show improvement over the present performance. With a truly middle-of-the-pack defense, OU will contend for a conference title and make a NY6 bowl. Good stuff, sadly for OU I don’t think any of that is going to happen to the extent necessary to salvage this season. There’s a lot of ground to make up on TCU, West Virginia, Texas Tech, and Texas in a bye week. I think simple still works, K-State is pretty simple, Baylor was simple when they won in 2013 and 2014. Auburn is simple these days. Texas was often at their best last year playing pretty simple in dime. You need to mix in stop calls and you need to force offenses to play within constricted spaces but sometimes that’s easier from a base. Definitely OU would benefit from being able to at least make opponents work and allow their own athleticism to show more. The OU-TCU game could end up looking like a calf-roping contest. Could be a lot of fun watching Wallow chase Murray around. And I’ve always bought into the idea that game performance is predicated on practice performance. Tackling in space, especially with the new targeting rules, is probably the single most underappreciated skillset in modern football. Tackling in space being hard for defenses, and running through tackles is key for offenses. Teaching these while maintain player safety–for both offense and defense–is really important now also. You want to teach the skill without exposing players to immediate injury risk and longer-term risks. I imagine someone in a lab is working on VR systems to simulate RB/WR jukes to train defenses and to create padded impact systems to train offenses. You gotta tackle in practice and you gotta embrace any and every new system for getting tackling reps. Michigan uses rolling tires, other people have other machines to train guys in the “rugby tackling” system so they can get lots of reps without having to murder walk-ons or offensive players, which is what someone like Lincoln Riley is ultimately concerned with. I don’t think you’re going to like watching Wallow chase Murray around, if that’s the story, unless Murray is running into a narrow and downhill space that’s the only spot being left open by a disciplined pass-rush. In that event, it’s not going to be much of a chase, it’s going to be Kyler getting out, seeing Wallow with an angle, and then sliding or dropping down. Ian, after reading your article “Why dime is now base defense” I am confused as to why you continue to suggest that the physical size of the OU defense is an insurmountable weakness? Texas does field a comparably tall secondary unit that also had speed (best of both worlds), however the top two defenses you list from last year, TCU and Iowa State, were all built around speed with smaller athletes. I’m just curious why you don’t think OU can make a similar schematic or philosophical change to match TCU or Iowa State? Good point, the more precise argument isn’t that Broiles or Radley are small (or anyone else in the secondary), it’s that they play small. Haughton is the closest thing to a hitter that Oklahoma has in the starting secondary. If you look at TCU, Iowa State, or Texas’ dime-ish defenses what you see are them flooding the field with DBs that can tackle and what’s more that are always looking to deliver a big strike. Garrett Wallow is a 210 pound LB who plays like he’s 240. Texas’ CBs Kris Boyd and Davante Davis are both 6-0 or better, 200 or better, and will lay people out. They are much tougher teams, defensively. It’s a mentality, they run into physical situations with confidence. Cyclone DB’s are tough mofos for sure. Ian…I will give you props on your predictions on OU’s D but you are wearing your Burnt Orange glasses on your comments on OU’s O. Comparing it to 2016 Texas Offense. Seriously? You said they were similar in that they could only do one thing well and then you actually rattle off 3 things OU does well. In addition to those things Kyler can throw pretty much the full route tree. Obviously OU misses Rodney Anderson tremendously but even without RA the RBs gained 130 yards on 20 carries against the vaunted Todd Orlando D. OU doesn’t lead the nation in explosive plays (and it isn’t even close) by only doing one thing well. You also made the comment that they aren’t as capable of executing in critical situations. Well they did have big 4th quarter drives against ISU, Army (not their fault Seibert misses kick) and of course the 4th quarter onslaught against the vaunted Todd Orlando D. Seriously if Norwood hadn’t bailed out Ehlinger on the PI do you have any confidence that UT would have stopped OU if OU gets the ball back with 2 minutes left? Having said all that…if you want to say that OU’s O may have one or two more non productive drives a game without Baker’s precision and RA’s running then I will listen. But this was only Kyler’s 6th start and Kennedy Brooks is starting to emerge. Anyway….keep up the thought provoking content. Obviously the OU offense is better than the 2016 Texas offense, the point is that they have a particular dimension that can be overwhelming but they aren’t as well rounded. It (unlike the 2016 Texas O) is a call driven offense, largely built around Riley’s ability to send in play calls that will attack a defensive structure and set up a clear read for Kyler Murray. That’s my main point. If they get into a crucial drive where Murray needs to make progressions and the defense has figured out the plays, OU is in a real pickle. That actually got them into trouble against Georgia as well, although Mayfield showed the ability to execute base concepts and Riley would still try to get cute instead. Norwood PI bailed out Ehlinger? Texas threw to their favorite big receiver on DBs that don’t turn for the ball, as they’d been doing all day, something good occurred as a result. Had it not worked out, it was still only third down and 11 and Texas had converted tougher situations than that multiple times in the game, haha. The OU run game is pretty solid still (agree that Brooks is probably the next great one) and the team is highly explosive, the concern is what happens against teams that aren’t overwhelmed by the athleticism and Riley play calls. Maybe that’ll be TCU next week, I’m still not ruling out the Frogs giving the Sooners a tough fight even after their defeat to Kingsbury last night. That is a better explanation of your perspective on the OU Offense. Largely agree with your Ga game comments although I think Baker was definitely not 100 percent in 2d half of that game due to shot to the ribs and lingering flu bug. Riley did get too cute at times. Should have ran RA more in between tackles.. In both OTs…RA gained at least 4 yards on the 1st play of both drives. Didn’t see the ball again either time. I’ll admit I was trolling a bit with my Norwood comment. Lol. However I do think Ehlinger was starting to tighten up a bit. Still likely even money UT gets 1st. My main point was I don’t see UT’s D stopping OU’s O if they had gotten ball back with 2 minutes left. I think every game OU is in has the potential to be a tough fight. That’s kinda the opposite of what you want at Texas or OU, that every game could be a tough fight. You want most games to be a beatdown.